This is a guest post by Michelle Bradley. Michelle began her career in translation 26 years ago after earning her M.A. from NYU in Madrid, Spain. Some of her first assignments as a newly-minted project manager included searching the Yellow Pages for Arabic translators, and fixing dial-up modem settings to meet late-night deadlines. It’s no wonder Michelle is now grateful for technology. Subsequent roles as Vendor Manager and Director of Operations prepared Michelle to open her own company (Colorado-based Wordtrail LLC) in 2010. Michelle currently wears multiple hats: project management, cultural consulting (including video creation), transcreation, copy-editing, transcription, DTP and translation from Spanish to English. 50,000 words for next week? 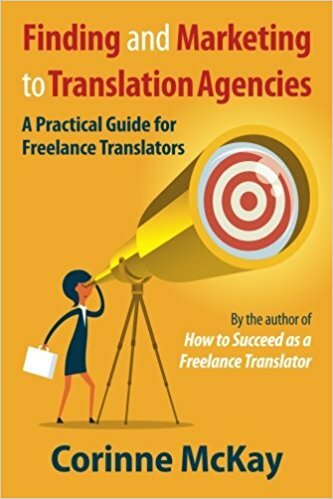 Your client has a 50,000 word job due in a week, so it has to be divided up among multiple translators. Why not provide extra services and visibility and take the whole assignment? It saves the client (Project Manager at an agency OR end client) headaches and time. You may earn more jobs since this makes you more appealing (scalable). My former translation agency colleagues heavily favored (quality) linguists who took on higher volumes. Small linguistic teams were in demand, especially teams who offered translation and edit. We knew small teams were advantageous in terms of consistency, quality, and efficiency. 1. Establish delivery/expectations with your client: target audience, source/target language variant, language register, deliverable (type of file, level of edit and file formatting). Priority: be sure you and the client are on the exact same page up front regarding which tasks they expect you to handle and by when. With software strings, ask client for character limitations. Ask about slide notes (PowerPoint), and always ask how to treat graphics or other embedded text. Make sure you get everything in writing. 2. Establish roles (you vs. client): establish who will reassemble files at project end and ensure consistency (formatting and terminology). Decide who will collect & address content questions, centralize terminology, do the final QA… etc. These tasks are normally part of your client’s job –the client may not be used to delegating, so all the more reason for clarity. This same concept applies to your team. Set expectations for your team (spell checking, etc.). If you delegate the editor role, be sure you and editor are clear on exactly what an “edit” entails. 3. Choose your translation team: only approach respected colleagues with whom you’ve previously worked. Establish responsibilities/roles within the team. 4. Define schedule: Factor in project prep, translation (determine your team’s average net words per business day), editing, QA (and formatting & format-proof, if applicable) into the schedule. Give one day (or ½ day) buffer, planning to deliver one business day before the client’s deadline. Bottom line, leave time for something unexpected to happen. If you need more time, ask the client if you can possibly stagger delivery of files. Consider staggering steps (start the edit before all translation is finished). • For multiple files, multiple steps and deliveries, set up a tracking sheet in a central location. It saves multiple team email exchanges! • Always specify time zones. • Avoid having substantive side conversations on text, skype or chats; choose communications that are easily searched in case you need to refer back to something. • “Paper” trails: after a phone call, send a quick email summary in writing. Your memory is not good enough to recall exactly who said what on which day. Sometimes this can be important – usually it only matters when something goes wrong, but finding the cause will be useful. 5. If formatting: to see how the file will look after translation, run the file through your CAT tool (inserting some sample target language) and see how well target file exports. Only accept formatting tasks if you or a designated team member really know how to format. Instruct translators NOT to touch formatting at all. Usually their efforts are in vain and create extra work. This task alone can derail a project. 6. Continually refine/tweak schedule daily, reminding team to check it daily. 1. Source analysis (identify questions before project start): this is easy to overlook. You may be “in a hurry” to start translation, but every minute spent examining the source will save you tenfold in the end. Be sure to ask if graphics or embedded text will get translated, and if so, will client or you be extracting such text to a Word file? 2. Create a simple style guide: saves time “fixing/unifying” (instruct on how to handle UI, acronyms, conventions such as a.m. p.m., degrees C/F, currency conventions, metrics, upper/lower case, time conventions (a.m., p.m.), etc. Do not make this guide into a novel. Include client’s preferred terms, if any. Send it to team with every project. 3. Existing TMs – establish TM reliability; instruct on whether 100% matches should be checked, and order of priority if there are multiple TMs. 5. File prep: hide DNT text, rid files of either metadata or other factors that throw off your CAT tools. 6. Assign volume/files to each linguist: if there are multiple files, try to assign whole files to each xlator. If not, plan to split larger files at logical stopping points, then distribute pieces of the file to each team member. Warning! Only split files if you first run tests (using copies of client files, not originals): run files through your CAT Tool (or your translators’ CAT tools), and rejoin files back together. This can be tricky and in my experience it’s safer to keep files whole. Test THE entire chain of steps before you decide your process. You may choose to either lock DNT (do not translate) segments, or hide text (in Word) to protect DNT content (i.e., hidden text does not get imported to Trados). Splitting files is inadvisable if you are working with a large Word file with an automated TOC or complex section splits. In those cases, keep files intact and carefully designate who translates which sections. Send copies of original (client) files to linguists with the translation files for their reference. For instance, don’t just send xliffs – because linguists should be looking at context, pictures, and should be aware if there are layout constraints. Try to assign similar sections (topics) to certain linguists. Always record all of this in your tracking sheet. 7. Language Lead will distribute established terminology – determine where/how. 8. Recombine files after translation before edit. Editor or you also run QA tools. 9. Final formatting & format-proof if applicable. 10. Before delivery, compare original source with your final target, side by side. Confirm to be sure client received files before you take off for your tropical vacation. If your files go to their spam, all your work was in vain. 11. Take notes if anything could be improved. Jot down these ideas before heading to the tropics. Establish payment terms and payment methods up front to avoid surprises. Be clear on whether you will pay your team members within a set period of time, or only after the client pays you. You want to preserve these professional relationships; clear communication is critical. On the other side of the coin, you risk your reputation when you accept such a project from an unknown client; only do teamwork with known clients who pay. Otherwise, you’re (ethically) responsible for paying your colleagues if the client doesn’t. The idea of this collaboration is that everyone ends up benefiting as long as you only take on tasks you (or your team) is experienced at, and you get compensated*. The client saves hassle, you get more work, and you bring colleagues together. These joint projects can be bonding experiences, and hopefully mutually beneficial. *Stay tuned for part two on considerations when charging the client, paying your team, and how to choose your team. A couple of days ago I turned down a request for 34,000 words with a deadline of March 12. (The end client thought it was reasonable to expect that an individual translator could handle such a volume in less than a week). It had not occurred to me that I could have accepted the assignment if I was willing to become my own mini agency and contract out parts of the assignment to colleagues. It is certainly an intriguing idea. Of course, in this case the end client was an unknown (they contacted me out of the blue on the basis of a referral), so I would definitely be uncomfortable about becoming personally financially liable to the other translators in case the client paid late or not at all. Thanks, Kenny! Hopefully this post will give you some tips for next time!